In recent years, there has been an upsurge in violence and a loss of morality in all levels of society, especially among the young. There are, of course a number of reasons for this. Many psychologists today feel that this problem stems from frustration. Analysts, on the other hand, point out that these misguided people are indeed a disillusioned segment of society searching for values and relevance in what they consider deceitful, materialistic, and absurd world of wars and decadence. Unfortunately, however, instead of constructively channeling their extraordinary energy and potential, far too many strike out in blind anger, destroying rather than building, or merely running away from it all by isolating themselves with drugs and their own worlds of fantasy. Presently, the tendency of "the stronger preying upon the weaker" appears to be at its peak. Frankly, the present world closely resembles a "corrupt age." It is obvious that this phenomenon of society is not merely because of the struggle for survival, but mainly because of an overdeveloped material and scientific civilization. The former misleads the young to the extreme materialism or egoism, while the latter seized human beings with fear, though playing an essential role in public welfare. Then what would be the remedy? Needless to say it is the development of moral civilization - the proper mental states of a human being as the lord of creation, enough to prevail or at least keep abreast with the development of material and scientific civilization. The utmost purpose of Taekwon-Do is to eliminate fighting by discouraging the stronger's oppression of the weaker with a power that must be based on humanity, justice, morality, wisdom and faith, thus helping to build a better and more peaceful world. All men, regardless of age, have felt that death is a shame, and lamented that they cannot live as long as the pine trees or the turtles that seem to live a thousand years. Righteous men, on the other hand, deplore the fact that justice does not always triumph over the tyranny of power. However, there are two ways to deal with these problems: The former, through mental discipline, the latter, through physical training. It is my firm belief that through Taekwon-Do, anyone can garner enough strength to become a guardian of justice, to challenge social disunity and, to cultivate the human spirit to the highest level attainable. It is in this spirit, I am dedicating the art of Taekwon-Do to the people of the world. The philosophy of Taekwon-Do is based on the ethical, moral, and spiritual standards by which men can live together in harmony, and its art patterns are inspired by the ideals and exploits of great men from Korean history. Korea's famous military and civil leaders who in nearly five thousand years of Korean history have never invaded their neighbor yet who fought bravely and made great self-sacrifices to defend their homeland against invading enemies. I also include the names of patriots who willingly gave up their lives to regain Korea's freedom and independence from the Japanese occupation. Each Tul (pattern) of Taekwon-Do expresses the thoughts and the actions of these great men, so the students of Taekwon-Do must reflect the true intentions of those whose name each Tul bears. 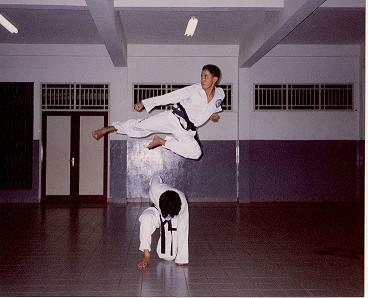 Therefore, under no circumstances should Taekwon-Do be used for any commercial or political purpose whatsoever. I have set forth the following philosophy and guidelines which will be the cornerstone of Taekwon-Do and by which all serious students of this art are encouraged to live. 1. Be willing to go where the going may be tough and do the things that are worth doing even though they are difficult. 2. Be gentle to the weak and tough to the strong. 3. Be content with what you have in money and position but never in skills. 4. Always finish what you begin, be it large or small. 5. Be a willing teacher to anyone regardless of religion, race or ideology. 6. Never yield to repression or threat in the pursuit of a noble cause. 7. Teach attitude and skill with action rather than words. 8. Always be yourself even though your circumstances may change. 9. Be the eternal teacher who teaches with the body when young, with words when old, and by moral precept even after death.